Attn: Click here to get Shades of Meaning Volume 2 - NOW AVAILABLE. 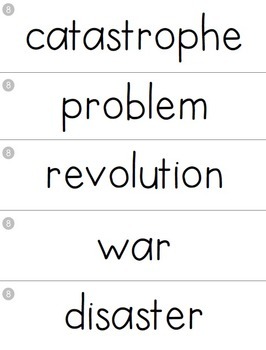 I created this 21st century vocabulary center to give my students a meaningful opportunity to work independently with others in a cooperative, collaborative and critical thinking setting, without me to work on and increase vocabulary and language. 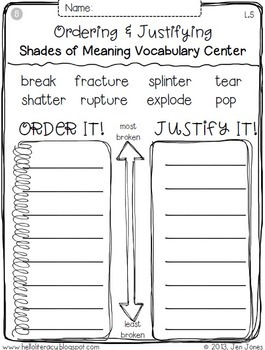 Students practice the 21st century skill of empathy while they follow "agreed upon rules of discussion" to evaluate and justify 8 synonyms and sometimes antonyms and all the shades of meaning in between, to agree on word meaning and "shaded" order...ranking words in order from "Most of to Least of." Please check out the Product Preview with classroom photos to give a glimpse into what this center looks like and sounds like. Students love this center because they are standing up, moving and staying engaged in conversation. This is a hands-on group center and may be done standing up using a pocket chart or sitting down at a table or on the floor. There are 38 center sets included in this product to last for 38 weeks--all year. 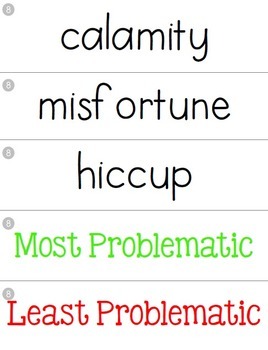 Each set includes 8 word cards, a header word card, a footer word card, an a recording sheet. My Common Core Rules for Discussion product, would lend nicely to this center to explicitly teach student "how" to communicate with each other at this center. Standards addressed in this center are L.5 (Language) and SL.1 (Speaking and Listening) in addition to the Common Core shifts of vocabulary development and word knowledge combined with the 21st century skills of critical thinking, communication and collaboration. In addition, research shows that vocabulary is also related to mental processes and skills that affect students' overall academic achievement. Stahl & Stahl (2012) explained that "children's ability to name things establishes their ability to form categories" (p.72). For example, a student who learns the word shake can subsequently attach other words and concepts to it, such as shiver, vibrate, wiggle, flutter, jitter and so on. As students develop more complex categorization systems for words, they are better able to summarize. (Kintsch, 1998) - Marzano. If you're interested, click HERE to watch a short video of a 3rd grade group doing it. If you're looking for another high quality, high thinking, cooperative, collaborative, text-based, vocabulary center, check out my Picture of the Day product, Describing & Inferring Key Details with Picture of the Day: Reading Photos Closely.